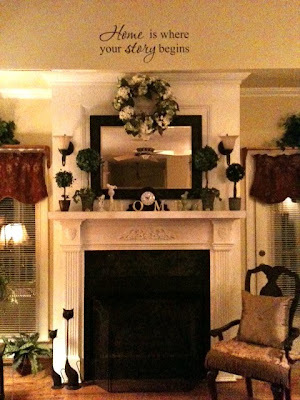 I finally got my wall decal up and I am just tickled pink with it!! I LOVE IT!! I was waiting for some other home decor to arrive before I made up my mind exactly where I was going to put it and I think it looks perfect over my fireplace. It was simple to apply and I didn't have the slightest bit of trouble." Here's a pic of my beautiful decal:"